The game of cricket for darts has been now adapted to work with a Vogelpik board. Cricket is one of the most popular games out there because it is a simple game that requires both skill and strategy. 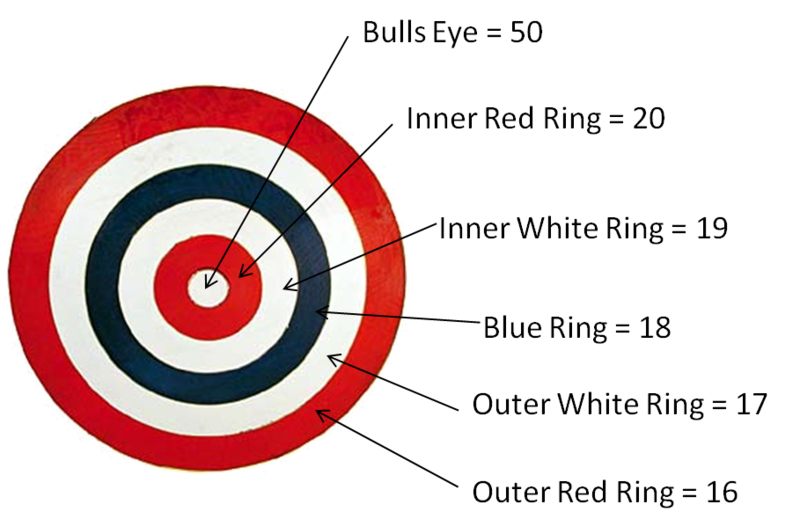 The only difference is there are fewer places on the board, so every ring of the board is used vs. only the top point values on a dart board. Cricket is played by 2 teams and you start by flipping a coin to determine what team goes first. Each round consists of each team throwing 3 piks. With those 3 piks, you are attempting to hit the same ring 3 times in order to close that ring out. Once a ring is closed out, you then begin scoring the point values associated with that ring each time you hit again. The rules state you can no longer score points on a closed out ring when your opponent has successfully closed it out by hitting that ring 3 times as well. We recommend that you mount your Belgian piks board right next to a chalk board so you can easily keep track of the score. If you don't want to hang a chalkboard, we recommend you use chalkboard paint to make your own scoreboard. Set up your chalk board with 3 columns with 20, 19, 18, 17, 16, and BULL indicated in the center column. The left and right columns are where you will mark your score. The first hit on a ring is marked with a "/", the second an "X", and the third an "O". Once that ring has an O you can begin scoring the point values until your opponent also has an O. The point values are outlined below and can be tallied on the far left or right of the board in order to be totaled at the end of the game.